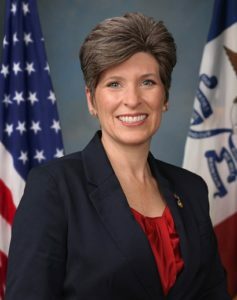 A partial federal government shutdown will happen Friday if lawmakers fail to resolve an impasse — and Republican Senator Joni Ernst says it’s unclear what may happen this week. The sticking point in negotiations has been President Trump’s demand that congress provide $5 billion for construction of a wall along the southern border. A White House spokeswoman today said the Trump Administration has found other ways to get that money. Democratic leaders in congress have repeatedly said there are not enough votes in the House or Senate to fund the wall. Ernst, who is now part of the Republican leadership team in the U.S. Senate, says that doesn’t make sense. That 2013 bill was the immigration reform package that passed the Senate with bipartisan support. It included a pathway to citizenship for immigrants who entered the country illegally as well as $8 billion for enhanced border security. The U.S. House did not take a vote on the package.